LOUISVILLE, Ky. (May 9, 2013) — Bourbon is making a huge comeback in the commonwealth’s largest city, where it formerly had a strong presence. Kentucky’s native spirit played a huge role in Louisville’s early days. Evan Williams, Kentucky’s first commercial distiller, rolled the first barrel of bourbon out of his Louisville distillery in 1783, just five years after the community was settled. 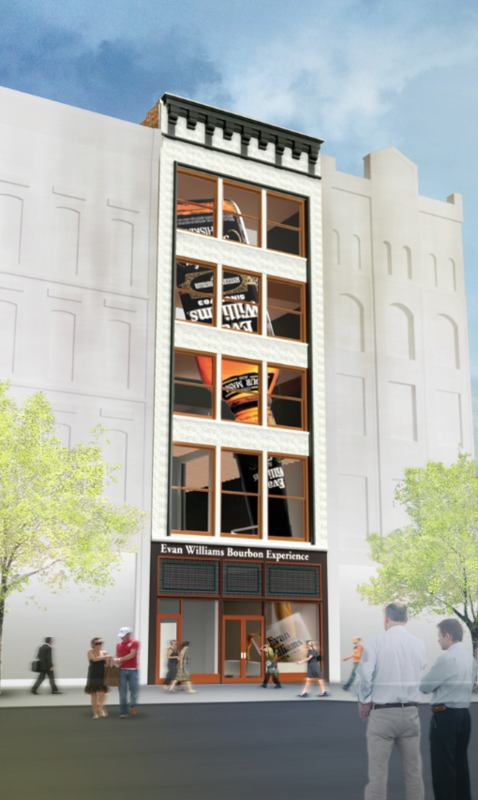 The Evan Williams Experience in Louisville is scheduled to open in September. Officials are expected to make a ‘landmark announcement’ today at the tourist attraction. Over the past 10 to 15 years, bourbon has re-emerged as a much sought-after spirit in the U.S. and globally. It is soaring to new heights of popularity, sales are up across the board, premium brands are flying off the shelf, and the industry is in its largest expansion phase since Prohibition ended. Interest in bourbon heritage is drawing thousands of visitors from all over the world to Kentucky, where 95 percent of bourbon is produced. 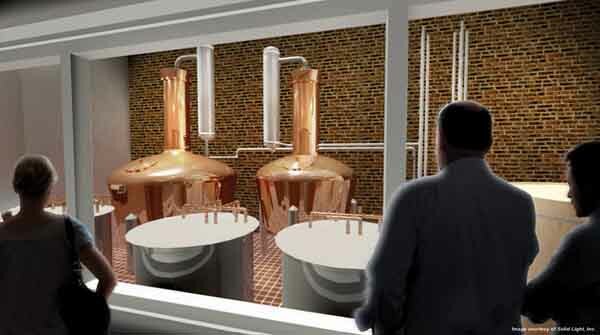 More than half a million people visited a Kentucky Bourbon Trail distillery in 2012. In short, bourbon is a big deal. Louisville is embracing its bourbon history and its location as an “entryway to the Kentucky Bourbon Trail.” A few years ago the city launched the Urban Bourbon Trail, a modern-day experience for the next generation of bourbon bar lovers, and has had great success so far. Several major distilleries are located in the Louisville Metro area, including Early Times and Heaven Hill’s Bernheim Distillery (where Old Fitzgerald is made), but distillers are coming back downtown also. One high-end producer is installing a distillery downtown, Beam Inc. (maker of Jim Beam and Maker’s Mark) has established its global services center on Fourth Street, and Heaven Hill is developing a tourist attraction on Whiskey Row right across the street from where Williams first set up his still. City leaders expect that investing in bourbon and its rediscovered popularity will bring jobs, economic development and more tourists, as well as renewing interest in downtown preservation. A group of investors is renovating and stabilizing a string of historic buildings on Whiskey Row. The unique cast iron façades of the buildings are being preserved, and developers plan a $5 million bourbon-themed attraction including live entertainment and food. 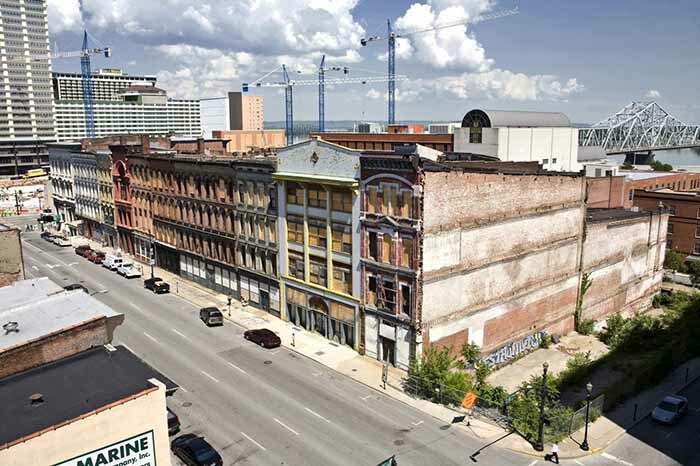 Final plans have not been announced, but bourbon maker Brown-Forman, which in the early 1900s had operations in the Whiskey Row block, has secured naming rights to one of the buildings. 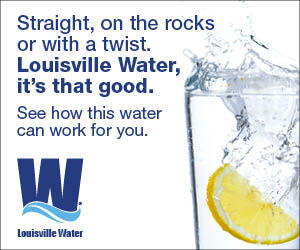 “The sky is the limit for what Louisville can do with bourbon,” Gregory said. Centered in downtown Louisville with a few stops in other neighborhoods, the Urban Bourbon Trail guides visitors through the city’s bourbon history and some of the world’s most celebrated bourbon bars. In addition to bourbon-inspired culinary specialties – such as mint julep pancakes, bourbon barrel-smoked salmon or a bourbon ball milkshake – most of the establishments are stocked with 50 to 150 varieties of Kentucky’s signature spirit. “The Urban Bourbon Trail has proven to be a success,” Gregory said. Like its rural and much longer predecessor, the Urban Bourbon Trail issues a printed passport booklet that is available at the Louisville Convention & Visitors Bureau on Main Street downtown or any of its score of participating locations. An app version is available for smartphones. Visitors who collect six passport stamps earn the rank of Bourbon Country Citizen and an Urban Bourbon Trailblazer T-shirt. 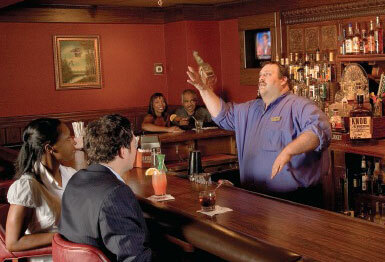 A bartender performs for visitors at Jockey Silks Bourbon Bar in the Galt House hotel. The bar offers more than 150 bourbons and is a stop on the Urban Bourbon Trail. Louisville’s downtown also is home to the Distilled Spirits Epicenter, where craft bourbon makers and aficionados can get a comprehensive look at and hands-on experience with the craft of distilling. Opened last spring by Flavorman founder David Dafoe, the facility offers a fully equipped distillery and a flexible bottling line. The company works with clients to develop distilled spirits and conducts educational workshops dubbed Moonshine University, where students learn how to derive, hone and layer flavors. The Distilled Spirits Epicenter recently became the first educational member of the Kentucky Distillers’ Association. Artisan distilling has taken off in Kentucky – and around the globe. The Epicenter allows amateur and entrepreneurial craft distillers alike “ample room to fine-tune flavors and experiment with applications,” according to its website. “There’s a lot going on right now related to bourbon,” said Chris Poynter, communications director for Mayor Greg Fischer’s office. High-end bourbon distiller Michter’s, which committed in 2011 to open a boutique distillery downtown, is spending about $8 million to overhaul the historic Fort Nelson building on West Main. Renovation is restoring the Romanesque cast iron and brick structure, which dates to the 1870s. Located across the street from the Louisville Slugger Museum, Michter’s will offer distillery tours and bourbon tastings. It will include stills custom made for Michter’s by Vendome Copper & Brass Works, a Louisville maker of stills used worldwide. Master distiller Willie Pratt is providing input on the design and custom manufacture of the copper pot stills. Already, Michter’s is reported to be considering a second distillery in Louisville to meet expected demand and a larger production facility that based in the Shively district of the city. Meanwhile, Heaven Hill is renovating its historic building at 528 W. Main St. to house The Evan Williams Bourbon Experience, a multimillion-dollar artisanal distillery expected to attract more than 100,000 visitors each year. Local and state officials, along with Heaven Hill company officials, announced today that the tourist attraction will be the eighth stop on the Kentucky Bourbon Trail and the first ever in Louisville. The Evan Williams Bourbon Experience will offer guided tours, where guests go back in time to see Williams’ original distillery, Louisville river wharf scenes and high-definition video renderings Whiskey Row from the turn of the 20th century. A dioramic video wall display allows guests to see how Heaven Hill’s modern Bernheim Distillery in Lawrenceburg, Ky., operates and how it is different from those in the first Williams era. Visitors then will see the modern-day combination: a state-of-the-art operation with pot stills from early bourbon-making days. “The gleaming copper pot stills are a modern version of the same type of equipment Evan Williams himself set up in his distillery along the Ohio River over 200 years ago,” according to Heaven Hill. The attraction’s tasting rooms will include one modeled after the interior of the Philip Hollenbach Co. Whiskey Distributor that occupied the building over 70 years ago prior to Heaven Hill’s acquisition. An artist’s rendering of Heaven Hill’s Evan Williams Experience depicts the multi-million dollar artisanal distillery that will be part of the downtown Louisville tourist attraction. It will open in September 2013. “This is a great project, not only because of Heaven Hill’s significant investment and the jobs it will create but for the history that is being reclaimed as the bourbon industry returns to Main Street in downtown Louisville,” Fischer said. On the industry’s traditional business operation side, Beam’s Global Business Services Center is expected to open fully by summer 2013 in the heart of Fourth Street Live! Beam, which owns dozens of liquor brands, is spending $1.7 million on the project. The 24,000-s.f. center will centralize financial and human resources activities, according to the company. It will be the primary point of contact for Beam’s North America businesses’ accounts payable, benefits, compensation, payroll and other key business processes. “Several other bourbon distillers are looking at opening different types of ‘experiences’ downtown,” Poynter said. Bourbon could play a particularly large role in what Poynter said is the potential for major growth downtown in the region’s already strong food and beverage business cluster. Barrel-aged liquor is driving tourists to Louisville, he said, which holidaymakers are using as a base for their Kentucky travels – visiting Churchill Downs and the Urban Bourbon Trail, taking distillery tours across the state, visiting horse farms in Central Kentucky and returning to Louisville. The city and region’s ultimate goal, Poynter said, is to become “the Napa Valley of bourbon,” drawing a comparison to California wine country’s tourism industry. Bourbon is playing a role in city economic development initiatives. For example, when Fischer made a trip in February to visit a business prospect in New York, Poynter said, upon arrival the mayor presented the group with a box labeled “Give Kentucky a Shot.” Inside were small bottles of Maker’s Mark, Woodford Reserve and Four Roses. 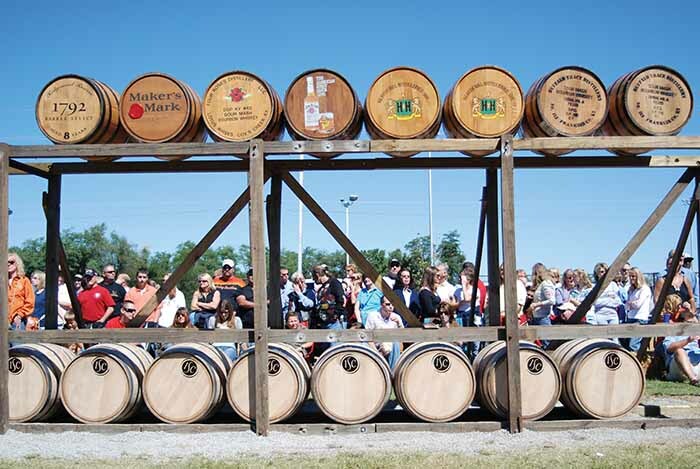 Begun in 1992, the annual Kentucky Bourbon Festival in Bardstown celebrates the state’s unique heritage.